After competition in more than 20 individual sports spread out across several cities in Minnesota with more than 12,000 senior athletes competing, the National Senior Games of 2015 are closed. For those unfamiliar, the National Senior Games take place during the summer of odd-numbered years (this year Minneapolis & environs, Birmingham, Alabama slated for 2017). To participate in the National Senior Games, an athlete must be 50 years of age or older and must first qualify at state games held in even-numbered years. 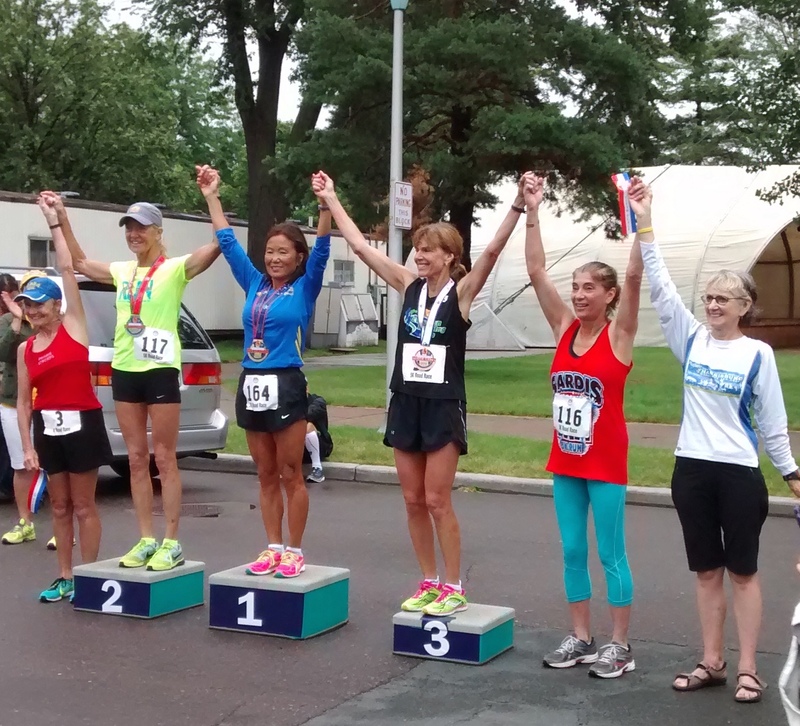 NSGA 5K – F65-69 top finishers. The 5K included runners in age groups 50-54 through 90-94. This was my second competition with the Senior Games and once again I come away with renewed respect for fellow athletes and renewed ambition and a promise to myself to train more consistently. Running is my sport and longer distance events are my friend. Still, I attempt to hang in there for the 5K and 10K, the longest running distances offered, for the opportunity to compete with some of the top senior athletes in the country. 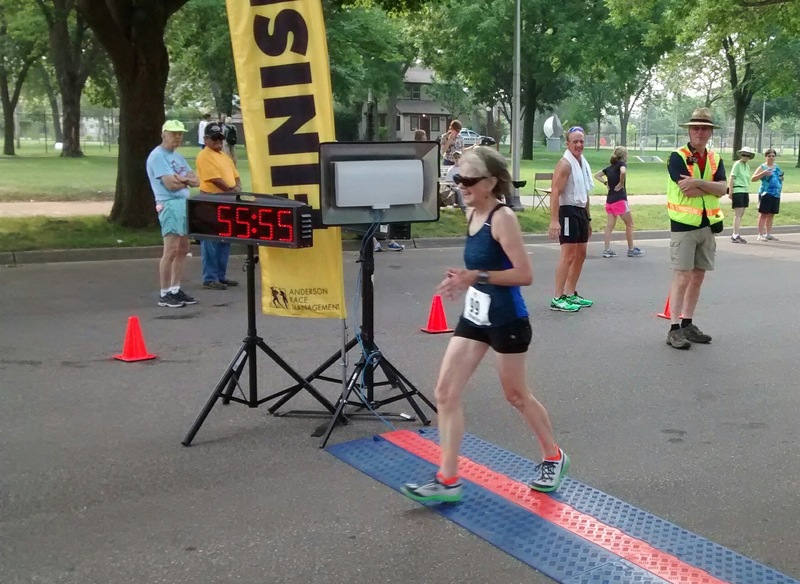 Both events were held on the same course at the Minnesota fairgrounds, with a two-loop 10K held the first day of competition, July 4. My road-tripping sibling support group and I arrived the evening before with enough time to pick up my credentials prior to competition. The morning air was muggy and the smoke from wildfires in Saskatchewan created a haze throughout the region. None of that seemed to slow down the competition. I managed to eek out a 4th place with a 55:20, just missing the podium. First place in the F65-69 AG was Jeannie Rice finishing nearly 10 minutes before me with a sizzling 46:43. A runner who can handle almost every distance, Jeannie holds the American record for fastest marathon for her age. July 5 offered a day off to hang out with the sibs, returning in a downpour to the Fairgrounds for the July 6 5K. Fortunately, it tapered off to a drizzle and had stopped midway into the 5K. I finished hat-in-hand as the baseball cap I wore to shield my eyes from the rain became a heat trap. There is an incredible amount of running talent for this event. Where else will any woman in the F65-69AG run a 5K when the top three finishers clock sub-23 minute times? The Senior Games acknowledge the top 8 finishers in each age group and podium spots to the top three finishers. I managed to sneak in at 7th place. Many of the athletes were far more ambitious than I and had qualified and competed in several other sports. Some participated in the triathlon held on the day between the 10K and 5K, many others participated in Track & Field events held the week following. Still others compete in swimming and cycling competition. 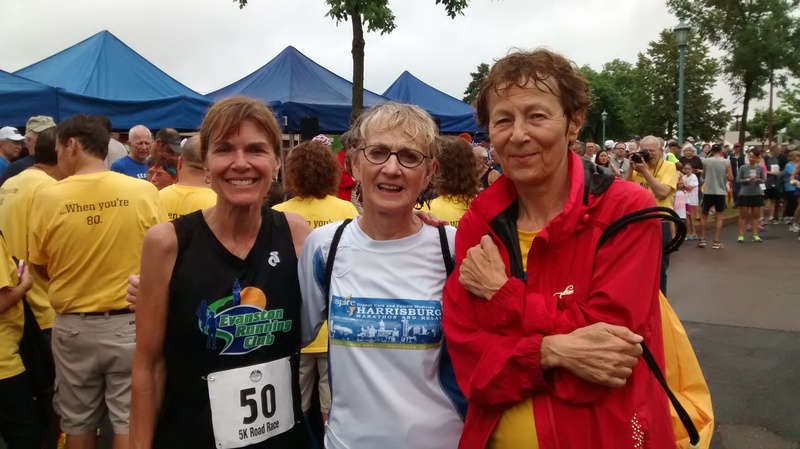 With one of my AG running idols Nancy Rollins and fellow age-grouper Sylvia Halasz. Always an opportunity to chat with fellow athletes at the Games. If you by chance are feeling the AG competition on your home turf has gotten a bit thin, consider looking at the state senior games in your state or a nearby state next year to get your qualification for participation in the national games for 2017. It’s a wonderful reminder of what can be achieved. And to that end – although I didn’t personally see this couple competing, I love the Runners World story and their formula for graceful aging and an interesting life.